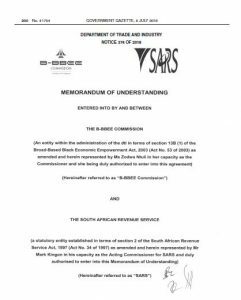 MoU between the Broad-Based Black Economic Empowerment Commission and the South African Revenue Service | MD Accountants & Auditors Inc.
Why do your SAICA and SAIPA Articles with MD? All material subject to our Legal Disclaimers. ü Please consider the environment before printing content from this website.